As you stand here in the wings, waiting to step on stage to give your talk, know that from the moment you reach the podium and start to speak, you’ll have a maximum of about three minutes to convince the audience that you are worth listening to. Sounds harsh, but let’s face it – its human nature. When we meet someone for the first time, we will quickly decide whether we like the person, if they are warm, open. And if we are going to work with them in any way, we will also form an impression about whether they are competent at what they do. Sociological research has shown that the concepts of warmth and competence are universal factors to “measure” others. Social stereotypes can also come into play, resulting in us putting people into boxes depending on what social group the person is, before they even open their mouths. One strong example of this can be how highly successful and competent professional women can be often recognised for their competence, but thought of as “aggressive”, or “bitchy”, and certainly not likeable. If this is true of meeting someone for the first time one to one, this is equally true when we “meet” a speaker for the first time. So, what about you as a speaker? 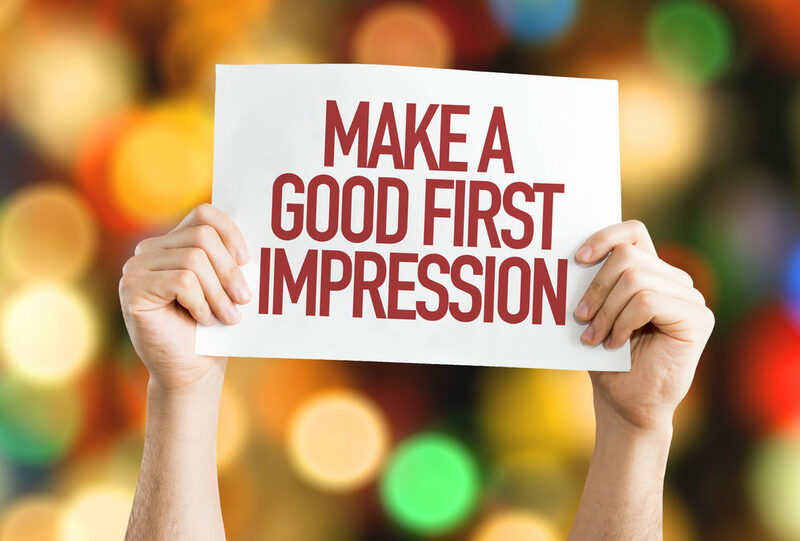 What impression do you make? When you bear in mind that you are speaking at this conference to position yourself as an expert in your field, someone clients can know, like and trust enough to come to for advice, the first minutes on stage are when you need to not only grab the attention of the audience, but also create rapport with them and establish your credibility. Here are seven things to do in those first minutes to help you come across as likeable and competent – and therefore someone your audience will want to work with. Ok, so you might be freaking out inside as you go on stage because this is probably the scariest thing you will do today, but don’t let the audience see your fear! Don’t look like you are having a thoroughly horrible/ boring/ tedious day. Connect with the audience by establishing eye contact, and smile! I know it can be comforting to hide behind a podium when you speak – and certainly there are a lot of venues in Luxembourg where the stage is set up in a way to hide the speakers – but if you can, when you come on stage don’t just head behind the podium. The podium creates a barrier between you and the audience – thereby making it more difficult to connect with them. Ask for a microphone in advance, and use a slide changer so you don’t need to keep going back to the computer. Start as you mean to go on by grabbing the attention of the audience with your opening words. A simple but effective way to do this can be to start with a fascinating fact or figure. You can also use a quote, ask a question, or simply give the bottom line of your talk up front. A lot of us living in Luxembourg have been brought up in cultures where it is frowned upon to say how fabulous we are – “don’t be tallest poppy in the field”, “don’t get ideas above your station”. But let’s not take it to the extreme by not even introducing yourself. Tell your audience who you are, why you are there, and maybe why you enjoy your subject. A simple way to do this without reciting your CV can be to tell a story of your own experience, or how you got into this field. In your intro, let the audience know what to expect in terms of content. This is strangely reassuring to an audience, as it lets them know not only that you have things under control, but also why they should listen. A simple way of doing this is to cover: the Context of the talk; the Objectives; the Map (or agenda); and the Benefits to the audience for listening to you. Much as I prefer speakers to talk without notes, our world of technical talks can make this difficult. If you are going to use notes, keep them under control, look professional. Where necessary, my preference is to use post card size note cards – these are discrete, and allow you to keep your notes to key bullet points. But find a way to keep them together, so you don’t use your place. Personally, I punch a hole in the top corner of the cards, and attach them together with a paper clip, or a metal ring like we used to use to attach the working papers of a tax return. And practice how you will manage microphone, slide changer and notes. One way to do this is if you must use notes is to put the slide changer in a pocket, and just retrieve it when you need it. As superficial as it might be, if you dress badly, the audience will start to see this and not listen to what you have to say. I am a great believer in being yourself, and not dressing in something that is uncomfortable. But I also know that this can be naïve – if I got up on stage for the first time to talk about tax in a pair of jeans and a t-shirt, few people would have taken me seriously. If you want to come across as credible – dress in a way that shows you as credible. So, as you stand here in the wings, waiting to go on stage to give your talk, collect together your notes, take a few calming breaths, and just go for it. It’s time to shine, and to show the audience just how likeable and competent you really are.